What is a neuroma? A neuroma is a thickening of nerve tissue that may develop in various parts of the body. The most common neuroma in the foot is a Morton’s neuroma, which occurs at the base of the third and fourth toes. It is sometimes referred to as an intermetatarsal neuroma. “Intermetatarsal” describes its location—in the ball of the foot between the metatarsal bones (the bones extending from the toes to the midfoot). 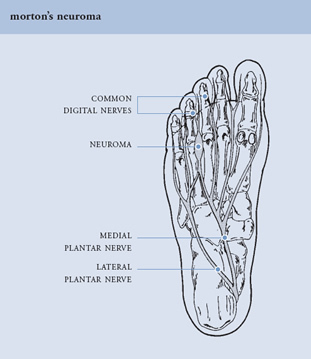 Neuromas may also occur in other locations in the foot. Anything that causes compression or irritation of the nerve can lead to the development of a neuroma. One of the most common offenders is wearing shoes that have a tapered toe box, or highheeled shoes that cause the toes to be forced into the toe box. Padding Padding techniques provide support for the metatarsal arch, thereby lessening the pressure on the nerve and decreasing the compression when walking. Icing Placing an ice pack on the affected area helps reduce swelling. Orthotic Devices Custom orthotic devices provided by your podiatric surgeon provide the support needed to reduce pressure and compression on the nerve. Activity Modifications Activities that put repetitive pressure on the neuroma should be avoided until the condition improves. Changes in Shoewear It’s important to wear shoes with a wide toe box and avoid narrow-toed shoes or shoes with high heels. Medications Nonsteroidal anti-inflammatory drugs (NSAIDs), such as ibuprofen, help reduce the pain and inflammation. Injection Therapy If there is no significant improvement after initial treatment, injection therapy may be tried. Surgery may be considered in patients who have not received adequate relief from other treatments. Generally, there are two surgical approaches to treating a neuroma—the affected nerve is either removed or released. Your podiatric surgeon will determine which approach is best for your condition.